The other day I tried a great recipe, actually a mixture of recipes, in preparation for our upcoming Fourth of July festivities. I wanted something bright, enticing and not too difficult. 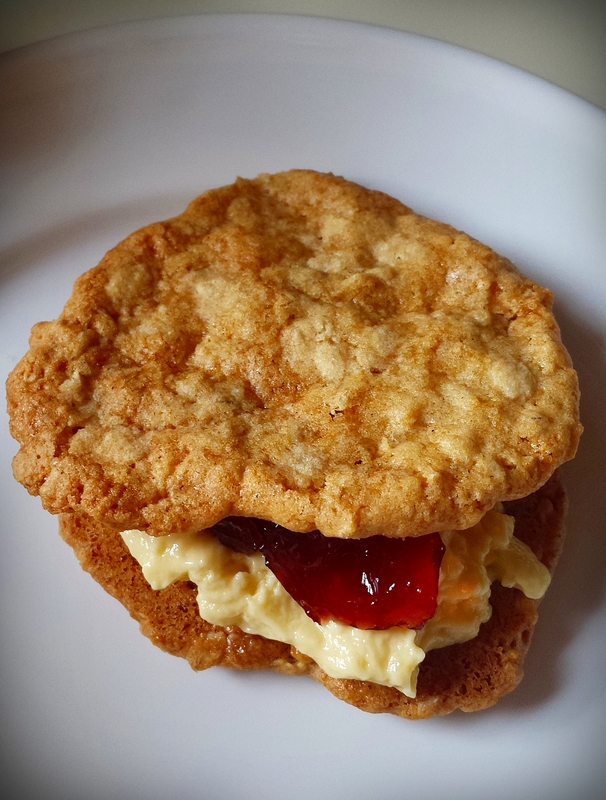 Annette has wanted to experiment with oatmeal cookies by making sandwich cookies out of them. Medallion cookies (or just medal cookies), as we’ve been calling them, are what sandwich cookies are often called in Denmark. We’ve noticed how plentiful they are as we’ve combed through Danish recipe collections. The name comes from the imprint often used to make them look like medals. Following the Mel’s Kitchen Cafe version of thin, crispy oatmeal cookies, I was amazed at how well I liked these. Generally I have an aversion to oatmeal in cookies, but I got over that quickly with these crispy-but-gooey-in-the-middle goodies. They’re utterly delicious on their own, but we decided to take them a step further, as I said, and make sandwich cookies out of them using pastry cream and sliced strawberries. Normally when I’m testing recipes I am able to use restraint and just take a couple bites. Not with these — I had to eat the whole thing. This is an early version I made with raspberry jelly, which was good, but the best version was with sliced fresh strawberries. I also tried blackberry jelly and red currant jelly. Those were both good, but didn’t make me want to break into song like the fresh strawberry version. Strawberries, especially the small round variety, are so loved by Danes. A note of caution: you may notice in the picture that I attempted to make heart shapes out of the dough. This was a definite fail, as the oatmeal dough just doesn’t lend itself to being rolled. I also had to add extra flour to facilitate the rolling process and that, I think, took a little something away from the crispiness. The combination of the crisp cookies, the perfectly sweet pastry cream and the slightly tart strawberries is just irresistible. I’ll be proud to serve these on the 4th – maybe I’ll squeeze in a few blueberries for good measure! In case you missed these above, here is the link to the oatmeal cookie recipe, with full credit going to melskitchencafe.com; and here is the link to the pastry cream recipe again, with full credit going to thekitchn.com.